Several people have reported that they could not sync Notes from an iPad to an iPhone, even though iCloud is turned on in settings. 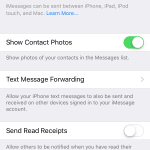 Check iCloud as the default account in the Notes settings. 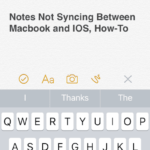 I have always had trouble with Notes syncing and occasionally had a note to disappear completely, but most often the problem has been with Apple’s sync method causing duplicate notes. That is, once I add to an existing note, I end up with two notes; the old one and the amended one. Then, 3 and 4 partial dupes. It has been occurring for me since the first days of Notes in MobileMe, then me.com and now iCloud. I get it fixed by laboriously eliminating the duplicates by hand, after carefully comparing them word by word, as the newest one isn’t always the one with every change. Then reset everything or even reinstall. There is absolutely no pattern to what causes this. At times, it has seemed to occur when I amended a note while on cellular, but lately it has occurred while on the same WiFi network using an Apple AirPort Extreme. I have done complete OS X and iOS clean restorations countless times, resets every possible way too numerous times to count and I’m still having problems. Yes, I realize that I’m being an idiot here for continuing to use the Apple Notes App. I blame it on stubbornness. Plus, it will work long enough to cause me to think the problem is over and then it reoccurs. Currently, running iOS 8 and Mavericks, I’m having duplicates in iOS, but not on OS X. The duplicates do show up on iCloud Notes. It is apparent that Apple has still not fixed their sync mechanism and I’m starting to think they are incapable of fixing it, after so long. Maybe they should ask Dropbox or Evernote for some advice? 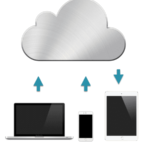 It seems to me that rather than a spokes and wheel type of mechanism, where all devices (spokes) sync back to the central server (wheel) that apparently Apple utilizes two wheels and spokes (iOS and OS X) connected by an axle (iCloud). I can’t figure out how else there could be all of these type of sync issues with iCloud. It isn’t just Notes for other folks. It seems from multiple user forums that there are always different sync issues affecting the sync of various data between the two OSs, but not so much within either OS. Why are they doing it this way? There is clearly a problem with the sync information getting down the axle and back quickly enough to prevent these duplicates. Apple should be embarrassed by this continued failure in something that myriad other startups have managed to figure out and do so relatively flawlessly across multiple platforms and devices and Apple can’t even get it right within their own ecosystem. Way to go guys! Steve Jobs was incensed about this (MobileMe not working right) before his death. If your own pride (iCloud engineers) won’t motivate you to fix this, won’t you do it for Steve, as I am sure this issue is preventing him from the peaceful rest he so deserves. And yes, I’m quite serious about that comment. As a customer, it is preventing me from the restful sleep I deserve, too! This has seriously wasted HOURS of my life and unnecessary concerns. I too am certainly not impressed that you cant sync previous existing notes. I followed apple’s instructions above on my iPad but notes would still not sync. Then I tried the same procedure on my iPhone … deleted iCloud account and out it back on and then the syncing wored again. Good luck to everyone. Is this fixed yet?? I am thinking all this time the cloud was backing up my notes. Today i accidentally deleted A VERY IMPORTANT NOTE and went to look for it on icloud….NO NOTES THERE???? How can i get them back????? I had to copy my notes (the ones I cared to “share”) into new notes on the “iCloud Account”. I did this in the devices. I have an iPhone 4s and iPad. I just upgraded to Mountain Lion (os x 10.8.2) and finally put an ounce of effort into resolving this convenience. Now the notes I copied and pasted, inside of each device, that I cared about, are now on all my devices. After checking that they were all there on iCloud, I just erased the (now) duplicate notes that were on the devices accounts. Thank you John from July 2012 for the info. I am sorry for any of you who have 300 notes etc, but it really won’t take you long when you get a rhythm going, although a silly problem for Apple to leave open. C’mon Apple!!! I understand it this way: that only newly-created notes on the iPad will get pushed to my iCloud account and not the notes from “On My iPad” notes account. This goes to show, Apple devices are no longer as easy to use as they once were. In this apparent concerted effort to force people to keep info in the cloud. i really hate it. And you know, even worse, now , you can’t sync notes directly from your phone to your mac. You have to sync notes on your iPhone through the internet to your Mac, both of which are consuming internet that you are somehow paying for. Apple was playful, now turning into a Monster. If Microsoft and hence windows fail, we’ll be in a really deep hole. I’ve really tried not to curse here. This is cr*p. Something as simple as copying notes or syncing notes created before iCloud is impossible without buying an after-market program. What is Apple thinking? I have over 300 notes I want to sync and I am told the only way to do it is to email them one-at-a-time? Problem with Apple is they treat their devices like toys for texting and taking pictures instead of serious uses real adults might find helpful. This is probably my last Apple product. It works but only with notes appearing after the iCloud synchronisation has been setup on the ipda and iphone. The hard way consists of sending the notes to the iCloud account and copy and paste them into new notes on http://www.icloud.com. But an easier way consist of just adding e.g. a letter of the first line / title of each note either on the iphone or ipad. They will be parsed as new notes and get synched. So Notes created on all of my devices under the “Notes/iCloud account” sync just fine. But how do I get Notes created on my iPad or iPhone accounts moved to my iCloud account without copy/pasting all of them? I cannot sync notes from iPod touch to iPad. Everything else will sync. Worked perfect, thanks as it had me stumped for quite a while. 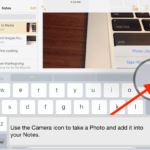 It seems to me that the Notes App allows for Notes to be shared when using iCloud, or not shared, i.e. private on the device. If you set iCloud as the default Notes account and create a NEW note, then it will be synced to all devices having Notes iCloud enabled. All EXISTING Notes that were created before iCloud came out supporting Notes cannot be synced unless you copy/paste them into a new Note with iCloud as the account. Yes… that’s correct! I’ve tried all of what’s stated above. Looks like a night of copy and pasting for me. I just tried the fix and cannot get the problem resolved. I’ll go in to the apple store and see if I can’t get them to resolve it. If they are successful, I’ll ask them to post the fix. I am having the same problem.. no matter what I try I can’t sync notes from iPad to iPhone 4 s.
I tried this on my IPad first but it did not help me with the Notes as when I go to turn on the sync in iCloud it asks me to create an @me.com account which is the same on my iPhone 4. Will doing this erase the notes in my iPad? I am not sure. I don’t think so, however I have bad experience with contacts disappearing from my iPhone after iCloud sync. I backed up my iphone notes to my computer using CopyTrans Contacts first. Only then I followed the steps and it worked – however, it is worth keeping a save offline backup of your iphone notes!